Polar bear populations in most of the Canadian Arctic Archipelago (CAA) must be booming, as they are elsewhere. That’s because the ‘experts’ were even more wrong in their predictions of future sea ice conditions than most people realize: they expected the CAA would remain choked with ice during a ‘nearly ice-free’ summer driven by human-caused global warming. Map presented by Wang and Overland (2012: Fig 3) shows what these experts thought a ‘nearly ice-free’ summer would look like, which they expected to occur by 2030 or so. Look at the map from Wang and Overland (2012) above, which is what they thought a ‘nearly ice-free’ summer would look like in the year 2030 or so. Wang and Overland used the same models used by USGS biologists to predict the future survival of polar bears based on habitat loss (Amstrup et al. 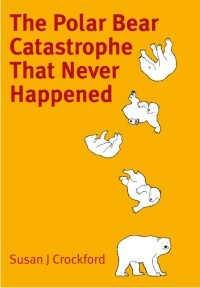 2007; Atwood et al. 2016; Durner et al. 2007, 2009). Note the thick ice in the CAA — what USGS experts call the ‘Archipelago’ sea ice ecoregion (denoted by white in the map), indicating ice about 1 metre thick (2-3 feet) — expected to remain at the height of summer in 2030. The problem is that ice in this region has been largely absent most summers since 2006, even though overall ice extent has been much more extensive than expected for a ‘nearly ice-free’ summer, as I show below. This is not another “worse than we thought” moment (Amstrup et al. 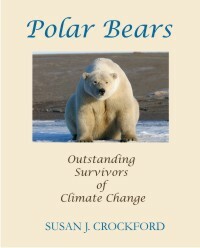 2007) — this is sea ice models so wrong as to be useless: failed models used to inform future polar bear survival models that got the bears declared ‘threatened’ with extinction in the US in 2008 (Crockford 2017). 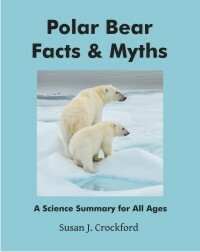 The polar bear subpopulation designated as Lancaster Sound lies at the eastern entrance to the Northwest Passage in the Canadian High Arctic (Fig.1). We rarely hear about it but this region has one of the largest polar bear populations anywhere in the Arctic – only the Barents Sea and Foxe Basin have higher estimated population sizes. Figure 1. Polar bear subpopulations with Lancaster Sound marked. Map courtesy IUCN Polar Bear Specialist Group, additional labels added. Lancaster Sound includes the communities of Arctic Bay on northwestern Baffin Island and Resolute Bay on Cornwallis Island. Devon Island, which lies on the northern boundary, has no permanent communities, although two research stations are present (see here and here). A more detailed map showing the exact boundaries is available in Vongraven and Peacock (2011). The eastern portion of Lancaster Sound is generally clear of ice by late summer (hence the Northwest Passage) but the western third of the region not only retains pack ice later in the season but some multiyear ice remains throughout the year. 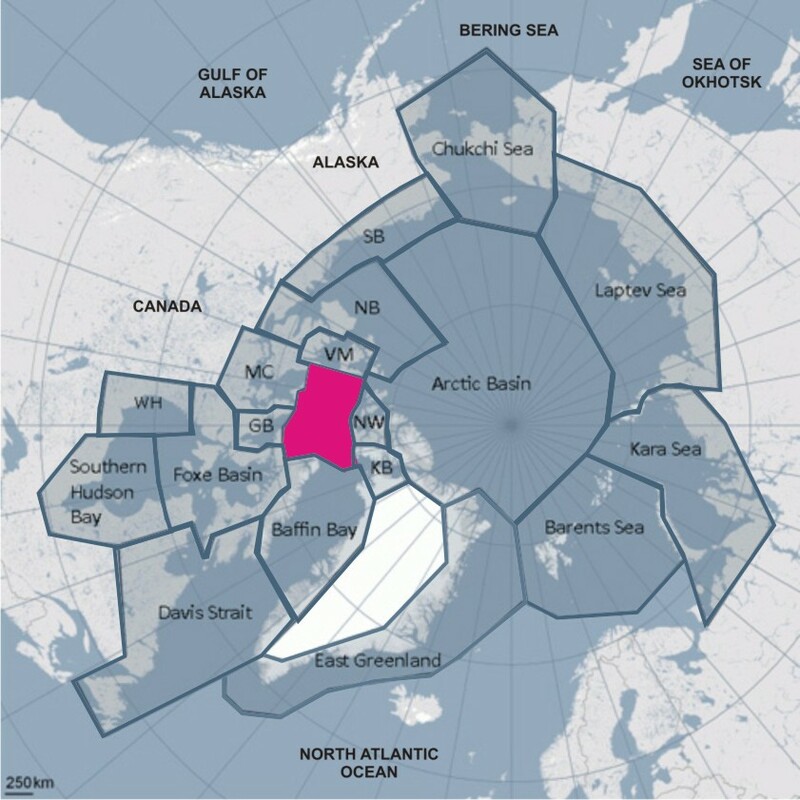 The proximity of Lancaster Sound to Baffin Bay and the eastern Northwest Passage (Fig.2) undoubtedly exposed polar bears there to hunting by European whalers during the 1800s and early 1900s (see previous post here, especially Fig. 5), from which the population appears to have recovered. On the other hand, the proximity of Lancaster Sound to oil and gas reserves further north in the High Arctic generated much-needed funds for polar bear biologists in the mid-to-late 1970s to collect essential baseline data for the entire region (Schweinsburg et al. 1982; Stirling et al. 1979, 1984; Stirling and Latour 1978). Figure 2. The main Northwest Passage route starts at Lancaster Sound and runs east through Parry Channel because these waterways routinely clear of ice in late summer. The approximate boundary of the Lancaster Sound polar bear subpopulation is marked in yellow; POW is Prince of Wales Island. Map from Wikipedia, labels added. Click to enlarge. It’s Thanksgiving weekend here in Canada. As a special treat, I thought I’d point you in the direction of a delightful bit of video footage of beluga whales. If you haven’t seen this Arctic Watch Beluga Foundation clip already, it’s worth a few minutes. It’s footage of belugas and their calves frolicking in the shallow water of Cunningham Inlet, on Somerset Island, Nunavut (within the Lancaster Sound polar bear subpopulation, which is north of the Gulf of Boothia subpopulation region that I discussed previously here and here). While I previously surmised that Gulf of Boothia polar bears might hunt beluga from remnant ice during the summer in years when the ice doesn’t totally melt (like they do in Hudson Bay, see belugas as food for hungry polar bears), it appears they also successfully hunt beluga in shallow waters like those found in Cunningham Inlet. But there is no hunting footage in this post. Link and further info below, including a map and references on beluga, and polar bear predation on beluga in this region.